This is a resort for families and young couples where one can immerse oneself in nature while staying in a truly elegant atmosphere. Explore a land perfectly balanced between past and future, rich in history, fragrances and art, or simply enjoy a holiday surrounded by the class and professionalism that only careful attention to detail can provide. 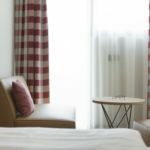 In addition to the comforts of the hotel, with rooms equipped with all the amenities that help make a stay more pleasant, our elegant restaurant offers local produce as well as Italian and international cuisine. The 3 pools with children’s area, outdoor swimming lake, belvedere with adjoining hydro-massage Jacuzzi and Sauna World all serve to elevate this resort, unique in Hungary. 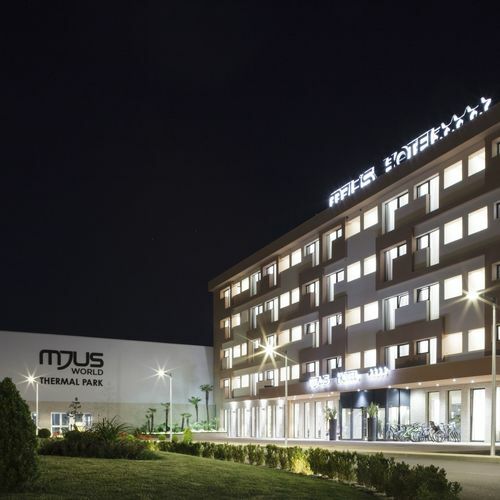 Mjus Children is the name of the area dedicated to the world of children, where parents can entrust their children to the care of qualified staff that will engage them in specially designed activities. Adults are then free to relax in the alluring wellness centre or to rid themselves of everyday stress in the fully equipped fitness centre. Finally, kids can enjoy themselves in the Planet Games area dedicated to both children and adults with a 6-lane bowling alley, interactive games, billiards, table tennis and more. For those who prefer to spend their time outdoors, Mjus World offers a large park with children’s rides, an amphitheatre, a barbeque area and camper park. All this is Mjus World, located near Körmend, a charming Hungarian town a few kilometres from the enchanting Lake Balaton, visitable by excursions and guided tours organized by the hotel to help one discover this wonderful land. The use of the Mozaic Pool, steam bath, Roman bath, bio sauna, Finnish sauna, outdoor jacuzzi, Kneipp path and emotional showers is allowed only over 16 years old. For those having food allergy we can prepare meals without the following components: Gluten, lactose, eggs, peanuts, milk, celery, sesame, lupin, crustaceans, fish, soybeans, nuts, mustard, sulphur dioxide, molluscs. Our hotel does not provide paleo dishes. Please advise us at least one week before arrival for special requests. In this case we can ensure the production of the special meals. Asking for Your understanding we also inform that we offer 20% discount from the accommodation fee for the bookings made for those periods. For the already confirmed bookings, beside guaranteeing the booked period with a discount, we also assure the possibility to move the booking to another period (excluding holidays) with the same conditions and original price. The total capacity of the room is 2 adults. With children under the age of with children under the age of 12, max. 4 people guests can be placed in the room. The rating of MJUS WORLD Resort & Thermal Park Hotel Körmend is 9.4 from the maximum of 10, based on 460 real guest reviews. Based on the reviews and comments of actual guests, the services of the MJUS WORLD Resort & Thermal Park Hotel Körmend have received a high rating of 9.4/10.